I’m sorry. I don’t know how to break it to all of you in the lower 49, and the rest of the world… We here in Alaska have known from Day 2 (on Day 1 we were too much in shock to think), that Sarah Palin was never going to go away for us. Win or lose, we would be branded with a big “SP” on our flank for all time. No longer would people hear we were from Alaska, and react with, “Wow. Is it cold? Is it dark 6 months out of the year? What do you do up there in the winter? Do you need a passport? Is crab cheap?” We knew from the beginning we’d be forced to answer questions about Sarah Palin for the rest of our lives. But you….you outsiders didn’t know. And we didn’t know either, that despite losing the race for Vice President….and in spite of actually causing the loss for the Republican ticket, that you would have to live with her too. No, people won’t be asking you if you know her, or what Wasilla is really like, or if you see her in the grocery store. But she will be in your life for a long time to come, like it or not. (patting you on the back). And the rest of the country may be seeing more of her than we will. We’ve been sans Governor for a while now, and there is a great deal of pressure for her to actually….I don’t know…..govern. But the siren song of the spotlight might just be too tempting for our newest and biggest celebrity. Her advisors may want her to stick around and work, but she’s been known to go “rogue” before. OK. (slaps a $20 bill on the table) Anybody want to bet me that she’s going to suddenly decide that she would be breaking ethics guidelines by accepting a multi-million dollar book deal, and a movie about her life? Anybody?……………….Anybody? Gallup Asks About Palin. 2 Out of 10 Republicans Need to Detox. It’s a lazy, slow news day here on the Last Frontier. I did, however, find some interesting Gallup poll numbers which are shown above. That’s right. When Republicans contemplate the woman who has the highest negatives of any prominent member of their party, the one who lost the election for John McCain, and the one who finds new and innovative ways to push the limits of embarrassing behavior on an almost daily basis, what do they think? Almost 8 out of 10 of them think to themselves, “Why THAT’s the gal for me!” I can’t help but think that the other 2 out of 10, those I like to refer to as the “sane” Republicans, have to be doing some major soul searching about now. I picture them all stricken, walking out of their houses in the morning, getting in their cars and driving for a long time to somewhere out in the desert. There, they fast and drink only spring water for two days, as they cleanse themselves of Fox News and Rush Limbaugh. After much burning of sage and other mysterious detoxifying rituals, they emerge from their vision quest with the solemn understanding that their party has abandoned them, and they are faced with the realization that in order to achieve inner and outer harmony, they must become Independents or Democrats, or perhaps for the adventurous few, Whigs. And with a sad, nostalgic and disbelieving look, they take one final glance back at the 8 out of 10, and leave them to collapse under the weight of their own delusion. Although it’s doubtful that this online petition will have any real teeth, it’s one of those things that just might feel good anyway. 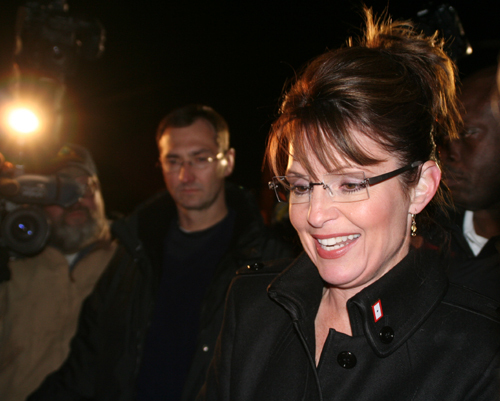 DEAR SARAH PALIN, PLEASE SHUT UP, ALREADY! Anyone interested in the Oregon Mudstock which is happening on Sunday, November 30 at 1pm at Sheri’s Restaurant in Tualatin, Oregon, email: susanstars at yahoo dot com! And there will be a Hometown Mudstock in Anchorage, Alaska! Meet on Saturday, December 13 at 2pm at the Middle Way Cafe, next to Title Wave Books on Northern Lights. The Forum thread is HERE. Good night, Mudpuppies. See you in the Night Kitchen Open Thread!